The full truth behind Lil Miquela's account may never become clear—but when it comes to confusing encounters with hyper-realistic digital humans, she's only the beginning. It doesn't get more 2018 than this: In mid-April, a Trump-supporting Instagram influencer named Bermuda hacked the account of fellow influencer Lil Miquela, who has over a million followers. Wait, no, there's more: Bermuda refused to return the account unless Miquela promised to "tell the world the truth"—the truth being that Miquela is not a human being. And in case you haven't caught on yet, neither is Bermuda. Both are CGI creations. The entire charade will likely continue on for some time, if not indefinitely, and the exact operational logistics behind Lil Miquela's account may never become clear. What is clear, however, is Miquela's influence—and the fact that when it comes to confusing encounters with hyper-realistic CGI humans, she's just the tip of the iceberg. The demand from brands is certainly there. Just look at what happened to Shudu, a CGI "supermodel" created by fashion photographer Cameron-James Wilson. Her account went viral when Fenty Beauty reposted a "photo" of Shudu "wearing" the brand's Mattemoiselle lipstick; since then, Wilson says, he's gotten offers from a bounty of brands in the fashion and tech worlds, all hoping to work with the CGI model. But virtual models and influencers like Lil Miquela and Shudu raise thorny questions. Last year, the Federal Trade Commission updated its endorsement guides to require influencers to disclose their marketing relationships and identify paid posts with a hashtag like #ad or #sponsored—but it's not clear how those rules would apply to influencers who aren't human, and whose backers, like Lil Miquela's, are shrouding themselves in mystery. "If this influencer doesn't disclose that a post is paid for, who is the FTC going to go after?" asks Adam Rivietz, cofounder and CSO of the influencer marketing company #paid. In the near future, Rivietz thinks, many companies may begin building their own digital influencers, simply because it's a more efficient way of controlling the message that reaches their target audiences. Human influencers, too, might begin embracing CGI alter egos to protect their relationships with their existing sponsors. "They could make a duplicate version where it's like, 'This is my real-life feed where I post certain things, but then here's my avatar of myself where maybe I work with different brands or do more risqué things,'" Rivietz says. Wilson, the creator of Shudu, suspects that digital doppelgangers will extend beyond even the world of influencers, and sees Shudu in part as a way of acclimating a mainstream audience to the idea of digital humans. "I think it's only natural that we will have avatars of ourselves eventually, or characters," he says. "The reason I want to get people into it now is because that is going to explode." There are already a number of startups working on commercial applications for what they call "digital" or "virtual" humans. Some, like the New Zealand-based Soul Machines, are focusing on using these virtual humans for customer service applications; already, the company has partnered with the software company Autodesk, Daimler Financial Services, and National Westminster Bank to create hyper-lifelike digital assistants. Others, like 8i and Quantum Capture, are working on creating digital humans for virtual, augmented, and mixed reality applications. And those startups' technologies, though still in their early stages, make Lil Miquela and her cohort look positively low-res. 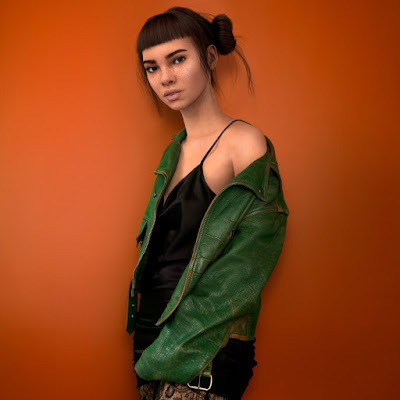 "[Lil Miquela] is just scratching the surface of what these virtual humans can do and can be," says Quantum Capture CEO and president Morgan Young. "It's pre-rendered, computer-generated snapshots—images that look great, but that's about as far as it's going to go, as far as I can tell, with their tech. We're concentrating on a high level of visual quality and also on making these characters come to life." Quantum Capture is focused on VR and AR, but the Toronto-based company is also aware that those might see relatively slow adoption—and so it's currently leveraging its 3D-scanning and motion-capture technologies for real-world applications today. The startup is currently piloting one use case for a luxury hotel, where a "virtual human" concierge greets guests in the lobby via a touch screen or kiosk and helps them check in; guests can then access that same virtual human concierge from their rooms and ask for anything from restaurant recommendations to help adjusting the lighting or opening the curtains. Down the line, Quantum Capture's Young thinks that, just as it might become commonplace for Instagram influencers to have CGI alter egos, celebrities may start creating digital doubles. "There's a really interesting revenue model built around that, wherein you might not get access to the talent themselves, but you might get access to their digital avatar, and the actual human being will make money off of the use of their avatar," says Young. If that latter sort of use case sounds familiar, it's because it's exactly the plot of the 2013 movie The Congress, in which Robin Wright, playing herself, agrees to sell off the film rights to her digital image. In that movie, things go predictably and dystopically wrong—and indeed, Young says he doesn't see 3D-scanned celebrity doppelgangers taking off until questions around rights management can be firmly locked down. But it's not hard to see a dystopian tinge even in today's rising ranks of virtual humans. Lil Miquela commands a following of 1.1 million followers—more than double the number she boasted in December—and though the influencer has used her power for good, encouraging her followers (known as "Miquelites") to donate to Black Girls Code and be better allies to transgender people, it's not hard to imagine another CGI account using its influence to spread hate or political discord. It's easy to eye-roll at a headline about two feuding CGI celebs. But they won't be the last—and their successors might not be so immediately easy to spot as fakes.